(Inside Science) -- On January 28, more than 3,000 finely dressed students, professors, and friends of the Vienna University of Technology will gather at the Hofburg Imperial Palace for the annual "Engineers' Ball." The ball is one of Vienna's oldest and boasts a special connection to one of the city's most famous musicians: Johann Strauss Jr.
Strauss Jr. -- composer of the "The Blue Danube" and known as Austria's "Waltz King" -- studied economics at the university, then called the Polytechnic Institute, before dropping out to pursue a music career. His brother Josef earned a degree in the 19th-century equivalent of mechanical engineering from the same institution, and even patented a street cleaning machine before being roped into the family music business. The Engineers' Ball brought both Strauss brothers back in contact with their old school. And it gave them a chance to honor the hot technology of a rapidly industrializing mid-nineteenth-century Europe with a little light dance music. Strauss Jr., for example, celebrated the study and application of the electromagnetic force with the debut of the "Electromagnetic Polka" in 1852 and the "Electrophorus Quick Polka" in 1865. The electrophorus was a simple device, consisting of two plates, that scientists used to produce and study electrostatic charge. Both pieces were dedicated to the "gentleman listeners of the technical school." But it's hard to say whether particular musical elements of the two pieces were inspired by electromagnetism. The Strauss family were great marketers and sometimes their titles were designed to be catchy to sell sheet music rather than to reflect a deeper scientific meaning, said Zoë Lang, a musicologist who wrote a book about the family. Still, in the "Electromagnetic Polka" many notes are right next to each other, an unusual effect that's not found in many other pieces by Strauss Jr., Lang said. By contrast, in the "Electrophorus Quick Polka" there is a lot of jumping around in the range of the pitches. The close notes and the large jumps might be meant to show attractive and repulsive forces respectively, Lang said, but that interpretation "may be a stretch." The connection between the title and the music is clear, however, in compositions like the "Acceleration Waltz", which Strauss Jr. dedicated to the students of the Polytechnic Institute in 1860. The pace of the opening strains quickens noticeably, and the motif repeats throughout the piece. "The waltz has been said to capture the feeling of a machine speeding up," Lang said. An early title page for the composition's sheet music shows a picture of a steam engine powering out of a tunnel. 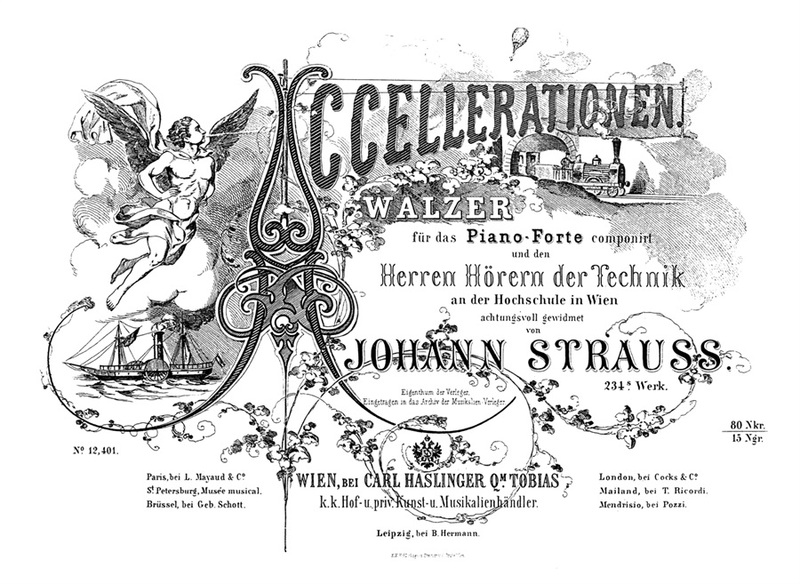 Sheet music title for the "Acceleration Waltz." Strauss Jr. had already honored steam engine technology the previous year in 1859 when he composed the "Flywheels Waltz," dedicated simply to "gentleman engineers." Flywheels are huge rotating wheels that store kinetic energy and were used to smooth the operation of the first steam engines. The notes for the "Flywheels Waltz," published by the record label Naxos, explain that "in the space of just 14 bars the waltz's introduction vividly portrays the gathering momentum of a flywheel until, attaining its stable rhythm, the work glides effortlessly into its opening waltz number." In all, members of the Strauss family composed more than 20 technology-themed pieces, both for the Engineers' Balls and for other occasions. This year the Engineers' Ball will again feature the first performance of a new piece by a former student of the school. "Hysteresis Polka," composed by electrical engineer and musician Martin Evanzin, was inspired by the rise and fall of the hysteresis curve of a magnetic material. The hysteresis curve shows the relationship between an applied magnetic field and the resulting magnetization of a material. The curve's loop shape means the material has a kind of memory, and for the same conditions may act differently depending on its earlier state. There might be more science and engineering inspired pieces on the way. Peter Mohn, a physics professor at the university, has served on the school's organizing ball committee for nearly 40 years. When presented with a few terms from modern physics that might inspire new musical numbers, he choose one that may well have boggled the mind of the nineteenth-century Strausses. "I think 'Quantum Entanglement Quadrille' would be a perfect title for a future composition," he said.